A deep cycle battery is a lead battery designed to produce energy for a long time. They are suitable for RV uses and they allow you to use your appliances off-grid. In this article, we will be reviewing some of the best deep cycle battery you could possibly find and also giving you some useful information about them. 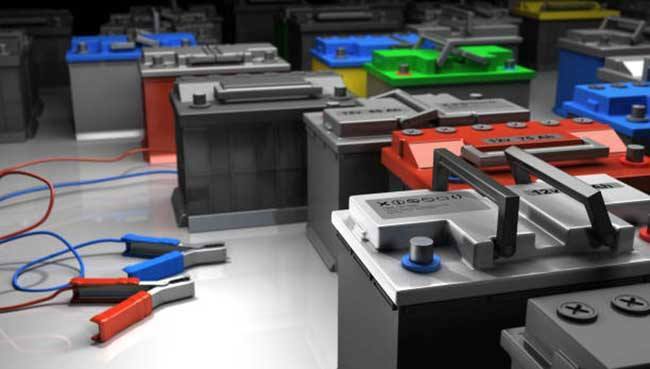 How To Choose A Deep Cycle Battery? When trying to purchase a deep cycle battery, you should consider how long the battery will last before it needs to be recharged again. 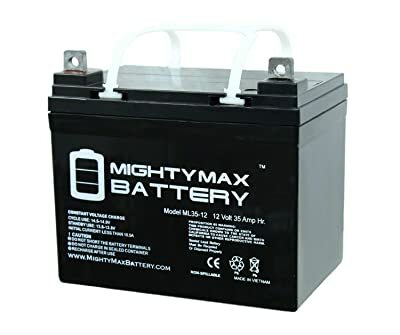 If you are going to need the battery for high-end purposes, then you should go for batteries with higher Amp hour rating. The size and weight of the battery are also important because the smaller the battery, the easier it is to move about. Also, when batteries weigh less, they do not add unnecessary weight to your vehicle. Volt rating shows how much power the battery has available for use. If you are going to be using the battery for bigger jobs, then it is advisable to go for a battery with a higher volt rating. This is the amount of time that will take the battery to recharge after use. The lower the charge time, the better because this means that you can get to use the battery quicker when it is down. This information is usually available on the manual of the battery you are looking at. Sealed lead batteries are one of the most popular batteries you could possibly get. As their name implies, they are totally sealed making the battery airtight. Although, they must have valve regulators to reduce the pressure. When we think about this literally, then we can say the battery isn’t entirely sealed up. This is why the battery has a second name which is VRLA (Valve Regulated Lead Acid). A VRLA battery produces energy through the use of oxygen and nitrogen and most of them have gel inside which makes them shock or vibration resistant. The Absorbed Glass Mat constructed battery is often known as the AGM battery. This battery is very efficient as it improves the discharge and recharge capabilities of the battery. The batteries are very similar to VRLA batteries and the only difference is that they are more advanced and they are generally used in powering high-performance engines. The AGM batteries have a voltage absorption range of 14 volts to 15 volts and float voltage range of 13 to 13.8 volts. It is important to note that for you to get the best out of AGM batteries; you should recharge them before the battery goes below 50%. This helps to maintain the battery’s cycle and also ensures that it holds a charge longer. One good advantage of this battery is that it generates immense power which makes it ideal for high end uses. Also, the flooded lead-acid batteries are cheaper which makes them a more attractive option. The batteries are also easier to diagnose as most times when there is an issue with the battery, it is because of the acid and water level. In addition, the flooded lead-acid batteries are the most durable of all deep cycle batteries which means it combines efficiency, power and durability. On the downside, the batteries must be placed in an upright position to prevent the battery's acid and distilled water from spilling. Gel batteries are very expensive and this is due to different reasons. The batteries are very strong and they are mostly shock and vibration proof. This makes them ideal for marine and aircraft use because they do not turn off due to the turbulent movement that can be witnessed on the sea or air. In addition, the batteries require little or no maintenance and this is because they are filled with gel and not water. Although refilling is not something that will be done frequently, you must note that whenever refill is needed, professionals are required to have it done. Furthermore, the gel batteries can withstand colder and hotter temperatures well and they can work well in any weather condition without reducing performance. Also, the batteries can be installed in any position you deem fit and it doesn't have to be in an upright position like the flooded acid battery. One bad attribute of these batteries is that they have a lower amount of power. However, this disadvantage can be offset by the fact that the battery has a slower energy discharge. These are the newest set of batteries produced and they happen to be one of the best when it comes to energy saving and power output. They are very durable and they can thrive in any weather condition and this is due to the fact that they are temperature resistant. Another thing we like about lithium-ion batteries is that they are lightweight and they can be installed in any position without worrying about spilling. The disadvantage of this battery is that they are very expensive and quite hard to get. In order for you to make the right purchase decision, we have selected some of the best deep cycle batteries and reviewed them for you. All you need to do is to read them below. 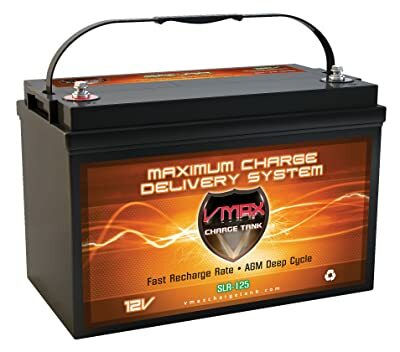 Vmax’s Vmaxtanks SLR125 is possibly one of the best deep cycle batteries available for sale. This battery is strong, requires little or no maintenance, and can stand the test of time. It is a 12 volt AGM deep cycle battery with a total capacity of 125AH which makes it a good choice for RV use. The battery is constructed with military grade custom plates which improve the durability of the battery. Also, the battery has 99% recombination capabilities that help to eliminate the emission of dangerous gas leaks. Furthermore, the battery has temperature-resistant capabilities and it can withstand temperature between -4° F to 140° F. This means that regardless of the weather, the battery's performance will not be reduced. Moreover, the battery is also vibration resistant which is another advantage of the SLR125. In addition, the battery has a lifespan of 5 to 7 years which is one of the highest you can get for deep cycle batteries. Another reason we like the SLR125 is because of its low self-discharge rate which is 1% to 2% in a month under room temperature. Also, with this battery, you can get over 3,000 cycles when the battery has a depth discharge of less than 10%. To charge the battery, you need to use a high-grade smart charger or AGM charge controller. Finally, we can confidently say that this battery is one that you won't regret spending money on. It has a lifespan of 7 years. The Mighty Max ML35-12 12V deep cycle AGM solar battery is a great option for powering trolling motors. The battery isn’t very powerful and with its 35 aH rating, it means the battery is capable of running 5 amps for seven hours. Regardless of the small rating, the battery will power Kayak trolling motors effectively. Also, the battery has a low self-discharge rate which means that it can hold a charge for a long time. Another good feature of the battery is that it has a fast discharge rate. Furthermore, the battery was designed to withstand different temperatures which means no matter how hot or cold the weather is, the battery will still work as it should. The battery’s absorbable glass mat technology is quite impressive too and this gives it an edge over some other trolling batteries. Another feature we admire in the Mighty Max ML35-12 battery is that it is spill proof. Speaking of the size of the battery, we can confirm that the battery is compact and lightweight. It has a size of 7.68" x 5.16 x 7.13" and it weighs 24 lbs. The battery is also resistible to shocks and vibrations. Finally, there's a 30-day full return policy on the product in case you do not like what you purchase. 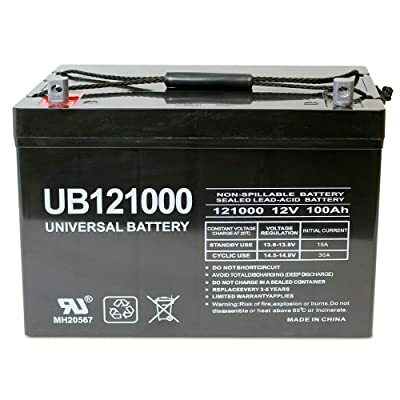 The Universal UB121000-45978 AGM battery is a high-end deep cycle battery with crank ratings of up 13.8V. 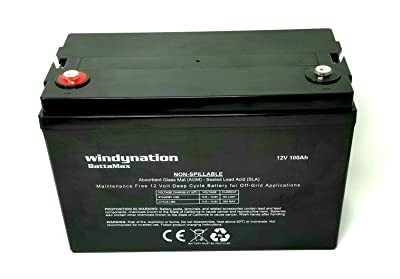 The battery is well suited to different uses ranging from boats, scooter and even wheelchairs. The battery also has a power of 100aH which is very impressive and ensures that the battery lasts for a long period. Another interesting feature of this battery is its low self-discharge rate which is 2% per month. This means that you can leave the battery on the shelf for a long time without having to charge them frequently. Due to its AGM tech, the battery is shock and vibration resistant. This means that the battery will continue to work regardless of how powerful the vibration or shock is. Furthermore, the battery has a spill proof construction which allows you to be able to mount the battery in any position he/she deems fit without worry. The battery also requires little or no maintenance. Finally, to give the user a level of assurance about the product, the manufacturer placed a one year warranty on the product. 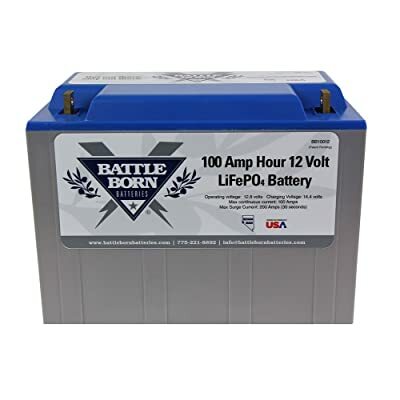 At 29 pounds, the Battle Born 100Ah Lithium-ion Battery is one of the lightest batteries on this list. The battery is different from the everyday lead-acid battery and this is because it weighs less and it lasts over 8 times longer. The LiFeP04 batteries are very strong, safe for use and perfect for UV use. Also, with 100% depth of discharge, the battery can still average about 3000 cycles. In general, the lifespan of the battery can be calculated as 3000 to 5000 cycles which is one of the highest you can get. Moreover, to attest for the durability of the battery, the manufacturers placed an eight-year full replacement warranty on the product. The battery is very easy to operate and it requires little or no maintenance. The lithium-ion technology of the battery allows the battery to remain charged even after a year. Furthermore, the battery charges faster, lasts longer and supplies a more reliable power. We will recommend the use of a smart charger with a suitable for lithium-ion batteries for charging of the battery. Also, the charging voltage should be within 14.4V to 14.6V for better performance. Finally, with its temperature resistant and auto cell balancing feature, you are assured of enjoying the battery more. 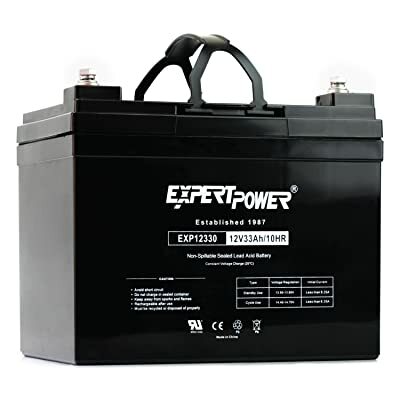 The ExpertPower Deep Cycle battery is a battery with 33Ah rating. The battery is quite affordable and its affordability doesn't mean it has its performance compromised. The battery can give users a run time of 10 to 15 hours of energy after a single charge. Also, the battery is made from high-quality nonconductive ABS plastic which makes it resistant to impact. The high-quality material makes it resistant to shock and vibration. The battery's material also makes it resistant to extreme temperatures which means that regardless of how hot or cold the weather is, the battery will still work effectively. Furthermore, the battery is spill proof which means that it is not only safer for use; you can also mount the battery in any position of choice. In addition, the battery requires little or no maintenance and this is mainly due to the fact that the battery is AGM build. The battery is compact and it weighs just 23 pounds which makes it easier to carry around. Finally, the battery has a screw-in terminal and this is a good thing because it isn’t brittle compared to the normal loop terminals. Can’t hold a charge for long when not in use. 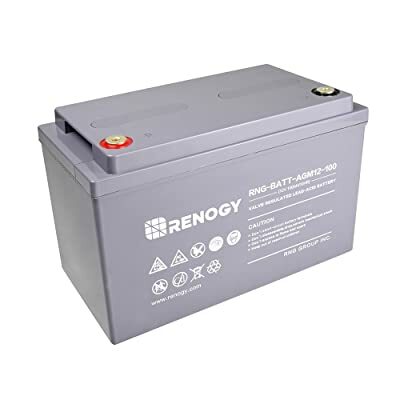 The Renogy Deep Cycle AGM battery comes in 3 different sizes which are; 6 volts 260Ah, 12 Volts 100 AH and 12 Volts 200Ah. The decision of which battery to choose falls on the voltage you need. The 12 volts types are bigger, stronger and have a higher current capacity. Regardless of the type you go for; the batteries all have a very low self-discharge rate. This low self-discharge rate is evident by the battery being capable of holding a charge for up to 9 months. Furthermore, because of the use of fibreglass sheets in manufacturing the AGM battery, the Renogy deep cycle battery is vibration resistant. This means that regardless of how strong the vibration is, the battery can withstand it. Also, for easy carrying, the batteries have a string handle that makes carrying easy. In conclusion, if you want an efficient battery with high current output, then the Renogy deep cycle AGM battery is for you. This battery was designed to provide constant power for high RV electric use. It is a 12V and 100Ah deep cycle battery that is more efficient than the majority of the deep cycle batteries around. The battery requires little to no maintenance and it can hold a charge for a very long time. Also, the lead battery is leak and spillage proof and this is due to the fact that the battery is totally sealed. In addition, the battery has a low self-discharge rate of 2% per month. With this, you can rest assured that the energy of the battery will not be expended easily when not in use. Furthermore, the body of the battery is acid proof and shock resistant. It can also resist vibration and thrive under ideal weather condition of 5°F to 113°F. It also has an average cycle of 300 when fully discharged and a cycle of up to 1300 when discharged up to 35%. The battery has an estimated float lifespan of 10 to 12 years and the manufacturers were kind enough to place a year warranty on the product. This helps to boost the confidence of the customers in the product they want to purchase. 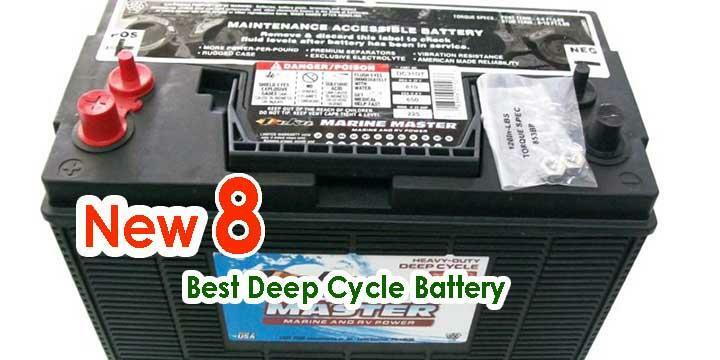 The Optima 8027-127 D27M Deep cycle marine battery is a powerful battery with 12 volts and it belongs to group 27. It has a cold cramping amp capacity of 750 and a marine cranking amp of 1000. This makes the battery a perfect choice for an extremely cold condition. In addition, since the battery is AGM technology, it makes it require little to no maintenance. Also, the battery is capable of receiving more recharges than the average lead-acid battery. Furthermore, the battery is spill proof which means you can place the battery in any position without worrying about damage. You have to be wary about the mounting stand of the battery because the battery weighs about 44 lbs which is quite heavy. Also, one of the best features of the battery is the ability to withstand vibration and shocks without losing power. One advice we have for users is that they should avoid overcharging the battery because this can reduce its lifespan. With a low self-discharge rate, the battery can hold a charge for a long time which means you do not have to charge it frequently when not in use. Additionally, the casing of the battery is made with polypropylene which makes the battery very durable. Finally, with The Optima 8027-127 D27M Deep cycle marine battery, you are assured of an efficient, long service battery that can withstand extremely cold conditions. Suitable for RV and boat use. It is susceptible to damage if overcharged. Step 4: Check the water level of the battery with the use of a hydrometer. If the level is not adequate, add distilled water to the cells. Step 5: Set your battery to slow or trickle charge and choose the volt option suitable for your battery whether 6, 12 or 24 volts. It is important to note that the batteries charge best when the charge flow is low. Step 6: connect the positive cable to the positive terminal post before connecting the negative. The positive is always indicated by red colour while the negative is black. After connecting the cable to the terminal post, turn the charger on, monitor the voltage regulator and ensure that the battery does not get overcharged. Deep cycle batteries require special care and maintenance to get the best out of them. When used with neglect, you find out that their lifespan is significantly reduced and they do not perform as expected. This is why we have decided to write about tips that will help you get the best out of your deep cycle batteries. Whenever you are using your deep cycle battery, you have to ensure that you keep an eye on the battery’s charge. This is to avoid a situation where there’s an unprecedented loss of power. To ensure that the battery life of the battery is maintained, make sure that you charge the battery when the battery’s charge level is not lower than 50%. If by chance you can't charge the battery at 50% charge level, make sure that the battery doesn't go lower than 20%. When you keep to this instruction, you are assured of having a long-lasting battery. To check the battery charge level, you can use different tools like voltage monitors, hydrometers and amp reading meters. Lead-acid batteries like deep cycle batteries when left uncharged for a long time suffer sulfation. This occurs when the lead sulfate gets crystallized and no matter how long you charge the battery, it can't hold a charge. To prevent this from happening, ensure that you get the battery charged from time to time even when not in use. This is because when sulfation happens, there is no remedy hereby cutting short the performance of your battery. After using a battery for a long time and after recharging, ensure that you let the battery cool down for a while before use. This is because when the battery can become hot after long use or after charging. Using the battery immediately after this can create grid corrosion which might eventually destroy the battery. 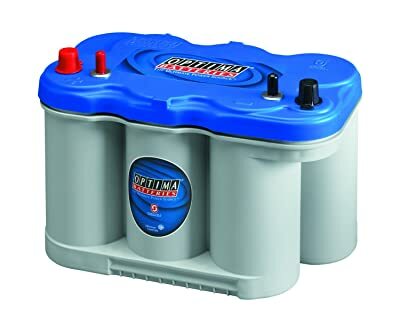 The importance of deep cycle batteries cannot be overemphasized and that is why we have decided to write about some of the best deep cycle battery available for sale. Out of the numerous deep cycle batteries we reviewed, the Vmax’s Vmaxtanks SLR125 stands out. This is due to its powerful 125 aH capacity, its durability, its shock resistant and its spill proof feature. Also, this battery can stay on the shelf for over a year and it still won’t lose power. Furthermore, we wrote about the different types of deep cycle batteries available and we are sure you have learnt a thing or two from that. Finally, we assure you that every product we reviewed in this article is of the highest quality and you won't regret buying any one of them.